‘Mary Mary quite contrary’ is an old nursery rhyme. Queen Mary, also known as ‘Bloody Mary’ of historical infamy was the daughter of King Henry VIII. In an attempt to break away from the Church of England, she tried to revert back to the Catholic Church in the immediate aftermath of her coronation. Systematic and purposeful murder of Protestants was carried out to achieve this end. Literary historians believe that this nursery rhyme is actually a cunning preservation of history by the tortured folk poetically immortalizing Queen Mary’s methods of torture. The silver bells stood for thumb screws that were torture devices and cockle shells were genital torture devices. The pretty maids in a row symbolized people lining up to be executed by the Halifax Gibbet, a guillotine-like device. “How does your garden grow?” was a reference to the cemetery, where with increasing deaths, the cemetery “garden” would grow. Four hundred and sixty years after the death of Bloody Mary, in a country once colonized by the British, two immature post-colonial men are quite contrary with each other. They are taking a troubled walk in their’ garden’, the country they have pledged to rule united, now a cemetery for reason. An electorate, baffled by uncertainty are watching the near total suspension of adult behavior. What is the anatomy of this infantile relationship between the President and the Prime Minister of Sri Lanka? To the rational mind, the singular person who deserves the joint contrary of Sirisena and Wickremesinghe is none other than Mahinda Rajapaksa. Instead of channeling their power and energy on bringing the Rajapaksas and their cronies to justice, both the President and the Prime Minister forgot the pact they made with 22 million citizens of this country at the drop of a hat. They both made cryptic and deceitful alliances with the two main persons of the Rajapaksa clan, Mahinda and Gotabaya Rajapaksa. It is widely believed that the ‘peaceful’ exit of Mahinda Rajapaksa, in the wee hours in the immediate aftermath of the Presidential Election of 2015 was due to a ‘gentleman’s promise’ extended by Wickremesinghe that ‘ all will be well’ if Rajapakse co-operated with a non-violent transfer of power. Although the above is not conclusively substantiated, the behavior of the said ‘gentleman ‘for the last three years of his Premiership is uncannily supportive of this claim. Small wonder how old buddies take precedence over the promises made to millions of citizens in a split second. Small wonder still is how gentleman’s promise made to a despotic ex-dictator (and to his brothers by proxy) can be kept religiously for three years but the people who have maintained him on a lap of luxury for decades are easily forgotten. Sri Lankans have a huge problem with naming phenomena. When a domestic helper steals five hundred rupees, she is a lowly worker class thief. When the Premier is connected to the largest financial scam (aka Bond Scam) in the modern history of the nation, he is still a gentleman, high class, and yes, a Royalist! Gosh, we must all continue to regard him an unreal, phenomenal, larger than life demi-god and continue to call him statesmanly, sophisticated, elegant, cultured (a pearl probably has more culture)and quite outside our league and feel grateful for his leadership! Then there is the Trojan horse, the President. Erected on the hope of 62 lakh voters, fed by the civil society activists, this Trojan horse came to the middle of the political city to make things right: dead bodies were unearthed, commissions appointed, rhetoric delivered. Millions of citizens who dared to dream of a better tomorrow rose from long political apathy to re kindle their sense of justice to oppose the only text book case of a despot that Sri Lanka has ever seen: Mahinda Rajapakse. The irony of it is that the hearts of those who outvoted Mahinda Rajapakse to enthrone Sirisena still loved Rajapakse, as one would love a brutal ex. They loved him for ending the 30 years’ arms struggle against the LTTE, for the city beautification, for the highways, knowing very well that all the Rajapakse fingers were in the national till. They loved him as they hated his brutish brat sons. They loved him as they also loved the smiling image of Thajudeen and wept for God’s tears. It was a national syndrome of love and hate. They wept as the very man they voted out just 24 hours ago left the Temple Trees ‘peacefully’ (what you don’t know can’t hurt you). Outclassed by the elitist Wickremesinghe and his esoteric buddies Sirisena appears to have lost his political nerve. Inept in the English language and in the art of getting those competent to decode difficult political scriptures, he fell in to the common trap of the rural disadvantaged who are an easy prey of soothsayers and bumpkin advisors. Equally uneasy with the tycoons of the private sector as with the elegant and west-philic Wickremesinghe, the conversation has died spelling the end of the anyway doomed marriage. Never before in the history of Sri Lanka has the class and privilege disparity between a President and a Prime Minister been so stark, infringing on the aspirations of a desperate electorate. He systematically distanced himself from the learned advisors with vast experience and maturity to seek comfort in serenade singers without insight in to governance who gave him false hope in perpetuating power. According to his own interview to Sirasa TV pre- local government elections, Sirisena actually believes that he can ‘salve the economy’ with the help of one individual, Prof. Lalith Samarakoon, who has self-imported himself from the USA for this purpose. He even fell for the teenage trap of Faizer Mustapha who actually convinced him, with the help of equally immature lawyer types that he can be president for six years instead of five. Sirisena didn’t need to understand the amended constitution to figure that he did not have a six year tenure. He just needed to know grade 5 arithmetic and a well-meaning grandmother to advise him to keep away from manipulative frenemies. Sirisena’s legacy could very well be this: to teach this country conclusively that we as a society should battle against poverty, inequality and class privilege. That keeping people in the fringes of inferiority complexes, lack of knowledge in English and under-confident political recesses can hurt a society. We can learn from Sirisena how emotional isolation and class insecurity can hurt a nation in ways we never imagined before. It is apparent in his body language. He is very much the emotional, rural relative bungling inside a seven star outfit. 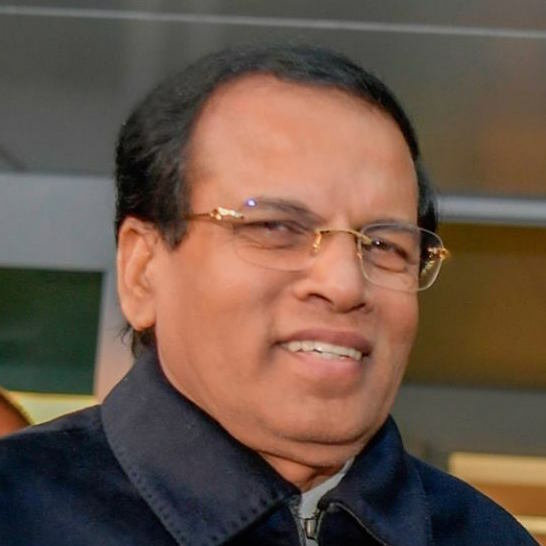 Sirisena is a mirror unto our own conscience to reexamine our priorities in education, softening social hierarchy, acknowledging the seriousness of privilege mismatch in politics and governance. To teach us this lesson he would soon sleep with the most dangerous enemy of all: Gotabaya Rajapaksa. Gotabaya Rajapaksa, in 2020 will deliver us all silver bells and cockle shells. Literally. Hundreds of Lasanthas, Thajudeens, Tarakis, Ekneligodas, and Noyahrs will manifest before our very eyes. The self-professed political pundits and arm chair political arithmeticians, who, due to their dissociation from the ground reality, naysaying to a Gotabaya comeback will understand that fact is indeed more intriguing, surprising and deadly than fiction. Rows and rows of countless citizens had finally let the reality of this failed government sink in to their minds. One does not have to be a pundit to understand that the no confidence motion of 4th April is directly executed by Rajapaksa with the blessings of Sirisena. The stinker letter of resignation written to the Prime Minister by his long standing private secretary Sudath Chandrasekera carrying embarrassing allegations laced with sexual intonations is widely believed to be architected by persons with close links to the President. One of the first web leaks of this letter, uncouthly and ruthlessly released one day before Wickremesinghe’s 69th birthday was via a local website believed to receive indirect Presidential patronage. 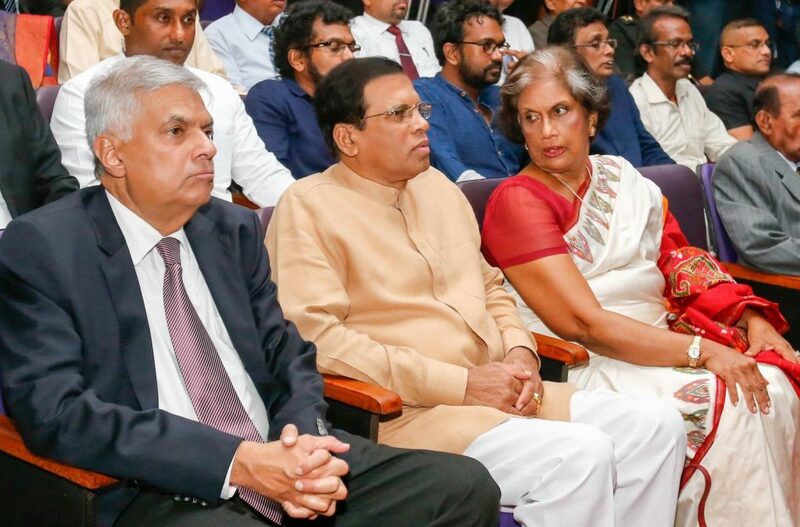 Today this downward spiral was compounded by an attempt by the President to remove the Central Bank from the purview of the Premier and place it under Mangala Samaraweera. These events stacked on top of another is meant to apply pressure on Wickremesinghe climaxing in to the no confidence motion. What Sirisena and his strategists perhaps do not realize is that Wickremesinghe is made of sterner stuff and his political heart is unyielding and self-regenerating like the mythological liver of Prometheus. Beyond the ideological and class clashes, this strained relationship has reached a new low of vanishing decorum. Both Wickremesinghe and Sirisena have been displaying the collective emotional intelligence of two teenage girls out of ‘Mean Girls’. When mean girls are busy conniving and not talking to each other they lose sight of the doom that awaits them. Both these political contrary Marys have every reason to grow up. The tragedy is that they both seem to be feeding the Rajapaksa python who would one day devour them both, not just politically but quite literally. What a brilliant piece of writing.Thank you very much.All 3 of them are power greedy politicians.This pseudo sword wielding preacher/sirisena is clueless.All talk and no action.just zero.But he talks like he is the saviour of the country. RW.After 40 years in politics is going to face a no confidence motion.This guy should have gracefully retired from politics long long long time ago.eventhough the NCM is defeted RW is been humiliated by Sirisena and the gang.One thing is for sure MR is the best conman/manipulater Srilanka has ever produced.This guy has master the act.There are hyenas waiting to grab power and turn back time again..The winner is….. well wait and see……..Good luck to Srilanka. It’s wonderful to have another well-written article. Of course, the result of reading through it is hardly cheering. Your previous article I analysed at length. I don’t have the leisure to do likewise with this, and I don’t really think it necessary either: isn’t this your main contention? One feels sorry for Sirisena, he is a victim of the circumstances that brought him the presidency. I think one of the questions that you are wrestling with is can a genuine man of the people become our leader. Please glance at the negative comments cast by some, from whom we may rightly expect more. Note also how ingrained racism has become in the Sri Lankan psyche. YOU are a man who could give leadership to us all – provided you have some way of reaching out to the Sinhalese. Thank you for your insights. As for your link on Ashley Halpe (Ashley and me)- I have known Ashley Halpe for long long years. We are all children of Halpe, knowingly or unknowingly. I thank you for the fine article and the brilliant, insightful writing. From your reply to Sinhala Man (another on these columns who I admire for his views), it seems you went to Peradeniya during Halpe’s time. You seem to have remained in the shadows despite your immense wisdom and skills – I’ve asked a few people in Lanka whether they have heard of you but have drawn a blank. How I wish people like you will come forward and speak to the masses above the heads of our totally stupid, greedy and power hungry politicians. Well written article about the Leadership of both President Sirisena and PM Ranil Wickramasinghe. These two who got elected to The highest offices in SL are too immature and not Leadership materials to run a country after 10 years brutal and despotic rule. In my opinion I place the blame on those so called Constitutional Lawyers like Jayampathy for Drafting a very clumsy 19th Amendment BAD in LAW and very immature. Removing the eligibility to contest the Presidency for the Third time for a President after holding the position for 2, 6 year period was badly drafted allowing a person like Mahinda Rajapaksa to contest as an MP. If that clause included person who held the Presidency for 2, 6 year period is not eligiable to contest any Parliamentry seat for life, Mahinda Rajapaksa should have gone to spend his time at Medamulana. If we allow Jayampathy to draft the New Constitution he may create more dangers than the country can handle. Constitutional Lawyer must draft a Constitution to evade future mishaps.. I hope Sirisena should open his eyes and do what is correct for the people of SL than allowing Gotabaya a chance to create another occasion to establish Shark Tanks, where People helped him be the first victims. Upasiri my man, if you were a constitutional lawyer, I hope you are not, your argument about preventing MR running for a parliamentary seat via a constitutional amendment would die at birth, for one, MR did not stay in office for 6 years during either of his terms as president, and for second, one cannot remove the fundamental rights of a person because he held the Executive position of a country, what else would you suggest be banned, ban him from voting for life as well? Let’s hope people will be prepared to what may ultimately come out from the ‘first time out in the open so called bond scam”.We may all be in for a surprise!! Sure things will unfold gradually at the correct time.Ultimately the people’s will must prevail. The power struggle is strictly an ‘upstairs’ affair. The Lankan minorities are nowhere near – not even ‘downstairs’. Come elections, the language/religion-divide will surface like in the recent LC elections. I read the article completely before making this comment, contravening my usual policy of commenting without reading. It was good. The author has dealt with the problem and described in detail what happened. I wish he had also indicated a way out of this mess. It is easier to analyze a problem than to give solutions to it. But that happens to be the most important part. Garusha Andrews, Likely a nom de plume, anyhow, it is distasteful how you brought up class as a qualification or disqualification to be a successful leader. MS by definition was uncouth by becoming traitor to the Rajapaksha government. Losing support when things started going south was not a result of his non-elitist background, his lack of eloquence in English or his incompetence in manipulation, (the latter you would call lack sophistication), but because of the snake in the grass culture of Sri Lankan politics and MS’s greed for power. MS should have recognized who his friends were and stuck to that. Compared with the way some people talk about My3 and his background, I don’t think that you are justified in being critical of Grusha Andrews. We are ALL people, I think, who voted for My3 because we wanted a change from the Rajapaksas. I was excited at the thought of a genuine villager heading this country. I consider him well educated. He has clearly read widely. I’ve worked in village schools; there are very decent non-English speaking intellectual types among them. I was proud that he had ridden a bicycle – doesn’t Corbyn in the U.K. do the same. I’ve made very lengthy comments defending the actions of My3. I can no longer do so, after reports emerged that My3 and the notorious thug, Gnanasara had met in Japan. A tragic figure has to be heroic, even in defeat. My3 is just pathetic. I still consider them only stories – these reports that My3 is now conniving with the Rajapaksa Brothers – I mean Mahinda, Gota and Basil. Is this the work of a thisaranaya in Tiger clothing? I didnt know they had a GARDEN. As far as I know they live in bushes and if you want to know how fast they grow go to Kantalai Sugar Factory and take a look. What a beautiful name! It reminds me Manel Jayasena and The Caucasian Chalk Circle. Thank you for the excellent piece. Thank you Singhala Man for alerting me to it. Yes, I agree with everyone that the article is very well written. I mean both the language and content. It still may be a bit high flown for an ordinary English reader, on assumption that the purpose is for as many to read and understand the message. While opposing all derogatory, jealous and unnecessary attacks on writers, I have to agree with Mr. Wannihamy that the issue with Mr. Sirisena is not the lack of English skills or the so called westernised sophistication that many people attach to Wickramasingha (I don’t though), but the lack of other personal attributes such as fearlessness, dedication, commitment and traits such as Charisma. In brief, he was chosen by people for the moment in the absence of other options. He could not live up to the expectations of all of us because he did not have the will, determination and the wisdom that are required to be a good leader. This says only 15 comments. Wherever have all the others gone?